It is perfectly normal to get stress out in an interview but too much of nervousness can be a set back or a backlog for getting selected in the interview. In every interview a person has to totally be ready for cross questions asked or test taken to identify the skills that the candidate has. Being a nanny as a profession is very different compared to other profession. One has to be very careful about his own hygiene and self-conscious about the things that they will be teaching the kids. There has been situations where nannies have been a bad influence on the children. 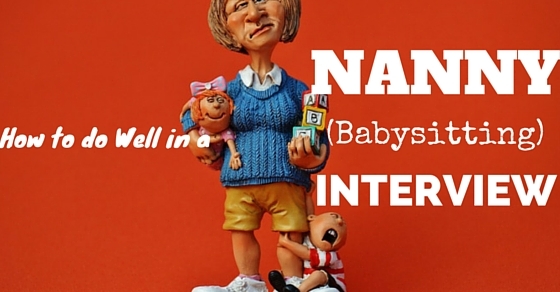 Here we have discussed few tips on how to ace a nanny interview. The nanny has a very peculiar job to take care of the baby and also the house. They should be always attentive that where the children are roaming, or what are they eating, their homework etc. It is same job as a mother who takes care of their baby. A nanny should be patient and affectionate towards the children because the ill behavior of the nanny can affect the children in a very bad way. Its their responsibility to nurture the children in best of the ways. The following are some points about how a person should know or prepare before appearing for an interview for a nanny, if they really want to do well and get the job. The following mentioned are few babysitting interview tips on how to ace a nanny interview. The nanny is always expected to be punctual on time for their job everyday. So, if the candidate arrive late for the interview then they have already got off to a bad start. So always arrive for the interview at least 10-15 minutes early. On doing this the person will have less stress and may also have time to spare if at all there is traffic on the road. Also know well where the location of the place and get used to the route so that there is not trouble later on and everything is known easily for the person. It is essential that the person interviewing for the nanny job should carry a number of things along with them, which will come to great use for them during the interview. Before going for the interview the person should see that their resume is updated and contains all the personal information such as contact address, contact number and also work experience as a nanny if done before. The person should print out a few numbers of copies of the resume on a good quality paper and carry it for the interview. The person or in this case the family would always like to know who the person is before hiring them. So as the family knows the person will be watching over their child, they would want to know all the important papers the individual will have with regards to their identification for processes such as performing background checks to confirm that the person is really who they are. So the person should also carry all the important identification papers for the interview. The person at the time of the interview needs to make the parents realize that they can count on them if ever an emergency situation arises. Let them know a list of some of the courses or classes done by the person which may be including CPR and first aid in particular. With the certificates, the family will understand that the individual is a reliable and a professional who doesn’t take their job lightly and is responsible enough to take care of their children in their absence. As part of the resume, the person should also provide the family with a list of all the references along with any possible contact information. The individual should print out certain letters of recommendation from their previous employers or any reviews describing them which should be included in the resume. This really benefits the individual in getting the job of a nanny as it makes the job of the parents much easier in hiring this particular person for the job. Before the person is in contention to accept the job, they need to basically put a ‘nanny contract together which describes what the job really involves along with working hours and salary, duties and responsibilities of the nanny. This contract in particular should be described later on in the interview when things are going in favour of the candidate and they are most likely to get the job as certain details which haven’t been discussed can be done in this segment. With respect to an emergency situation, this is a great thing to have in the resume of the candidate. This shows the family the concern that is there for their children in case there is an emergency. It includes a list of contact places nearby in the area where the family can go if there is an emergency to their children and copies of such a list needs to be given to the nanny. The person should also have with them a schedule describing how the job of a nanny is to be carried out on a daily basis. It is really a good way to show the parents how well the person will plan out the entire day for their child instead of ignoring their child in their absence. This log should include certain activities which are great for the child at that age like times for meals and snacks, time for naps etc. and it can be detailed in any way the individual wishes for it to be in. The resume should also contain certain activities that the children will enjoy doing with their siblings and the nanny. Certain activities with respect to art to craft which can be enjoyed by the child on a day inside the house according to the child’s age group should also be mentioned. This is a quality which all the families would be looking for their child so this will increase the chances of the person to get the job. If the person has previously worked before as a nanny for a family they can even include those memories such an album of photographs with that child to show the parents how great the person is with kids. This is a way of putting great efforts into the interview and even the family will understand this and realize that this individual is the perfect person for the job as their nanny. For any kind of interview no matter how big or small, the person should always dress appropriately for the interview so that they look professional enough. The person should dress in such a way that they look like a person the parents can trust in handling their child. The dressing attire shouldn’t be anything too revealing. The clothes worn should be appropriate enough for a day job and even with respect to shoes, something which fits comfortably enough should be worn by the person. Sometimes it is possible that the children might be present along with their parents at the time of the interview. This is the best advantage that the person can interact with the children so that they can start liking the person. Make eye contact with the child, come down to their height and talk to them. Ask them certain questions like what activities they like doing, what games they like playing etc. Interacting with the children gets the person one step closer towards getting the job as the children is also familiar with them. Any kind of job interview is always stressful for the person in some way or the other and the nanny interview can be the same as the person doesn’t know what questions the parents are going to ask them. Though if any kind of pressure arises during the interview, it is important for the person to stay calm and not get nervous. Always stay conscious regarding the posture and don’t fidget when nervous. Always appear confident in front of the parents. In today’s world everything runs on technology. So person before going for the interview should be smart enough to remove an inappropriate content regarding them on social media which may lay a bad impression on the family. As wanting to know the person more in detail, parents will do a background check by looking up on social media to see what kind of a person the individual is. It is always important for the person to not get distracted in any way during an interview and maintain a complete focus. So it is recommended that the person should switch off or keep their mobile on silent mode as they will ensure complete silence and no further distraction from their mobile arises. If it isn’t done then the phone might ring during the interview which may be unprofessional in nature. It is always recommended for the person to carry a pen and paper along with them so that it is easier for them to take notes whenever required. It shows that the person is interested for the nanny job, it makes the person looks well prepared, any important information can be easily jotted down etc, which will even be appreciated by the parents to show how much dedication is given towards the job by the person. Always the person should never have any negative attitude or comments regarding the people who they previously used to work for. These kinds of comments made by the person will only show behavior filled with negativity and an immature attitude towards the parents. So always have a positive attitude towards any of the previous jobs the person has and should always speak positively about it. At the time of the interview, it is necessary for the person to not go off aside the topic and stay completely on the topic which is being discussed by the parents. So the person must never ramble away not knowing what they are talking and also never mumble to themselves as the parents may start thinking that the person isn’t open with them regarding certain things. After the interview is over, not regarding the fact that the person got the job or not, it is a courteous behaviour for the person to send the family a note either by an E-mail or a letter to the family. This is basically for thanking them for providing time for them and also thinking them worthy in regards and interests of the job for a nanny. It is always advisable for the person to know what to answer the parents if any common questions are asked to them and they must answer them in a professional way to show that they are prepared. Why does the person want to be a nanny? What was the last job and why did the person leave it or discontinue it? What does the person enjoy when working with children? How will the person handle a medical emergency? How much does the person value childhood nutrition and in what way can they make improvements to it? How are the person’s views towards disciplining children? How was the daily routine of the person in their previous nanny job? How well do they spend their free time?